Tutorial for Version 6 of Brothertm PE-Designtm,/BabyLocktm Palettetm home digitizing software is shipping now. There are over 300 videos for 10+ hours of viewing and 278 pages of printable class notes. Every icon, menu item and tool is covered in detail and with a video. Hints and tips are given through out the tutorial. Learn to use your digitizing software to its fullest potential. Unlike seminars, you can refer back to the tutorial over and over again whenever you need to. Watch and review a video until you are comfortable with your grasp of the subject. The tutorial is on THREE computer cd-rom disks. 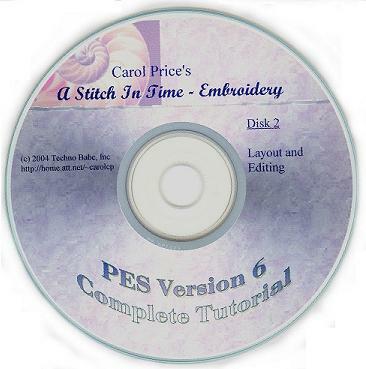 Disk one contains the art work used in the tutorial, design files and printable document files, videos for Design Center, Design Database and Programmable Stitch Creator. Disk two contains the screen show lessons for Layout and Editing and Disk Three contains the Digitizing portion of the tutorial. The tutorial runs right off the cd, you do not need to download any other software to run the videos. You do not need to purchase any previous tutorial. You will need to have Adobe Acrobat Reader http://www.adobe.com installed on your computer to view and print the class notes. This tutorial runs best in Windows XP and lower operating systems..
Folder - documents (printable class notes, and cheat sheets). Be sure to check the chapters for new and hidden features in Layout and Editing and Design Center. Screen Show - Layout and Editing - all menu items covered in a video. Also sections for hints and problems. Copyright (c)1998 - 2015 Techno Babe, Inc.